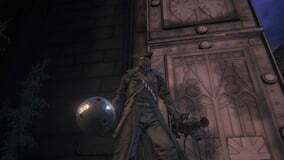 Tonitrus is a Trick Weapon in Bloodborne. "A unique trick weapon contrived by Archibald, the infamous eccentric of the Healing Church workshop. Striking this peculiar iron morning star flail like a match generates the same blue sparks that blanket a darkbeast. Unfortunately, for reasons untold, the hunters of Archibald's time did not fully take to the device." This trick weapon doesn't have a "true" transformed mode. Instead, pressing the L1 button will buff it with bolt damage for a short period of time. After a certain time passes, the buff will end, forcing the Hunter to repeatedly buff the weapon in order to utilize its full potential. When transformed, the Tonitrus gets +0.4 Arcane scaling, +70% bolt damage, and +40 flat bolt damage. When you are at full health, the Tonitrus's AR displayed in your character's stat screen is erroneously high. There is no change in damage dealt by the Tonitrus whether you are at full health or not. The Tonitrus's transformation doesn't use stamina (baring the transformation attack) as such it can be buffed without interrupting your stamina bar refilling. Acquire the Spark Hunter Badge by defeating Darkbeast Paarl to purchase from Messengers. Gems that increase Bolt damage (Bolt, Bolt Damp, Bolt Abyssal and all Cursed variant Blood Gemstones) will significantly increase damage on this weapon when self-buffed. It is possible that gems that increase blunt damage (Adept, Adept Damp and all cursed variant Blood Gemstones) can give a higher net increase in damage than physical ATK gems (upto 32.6% damage increase compared to 27.2%) since all attacks on this weapon do blunt damage. Note: The status screen will show the damage to be lower when blunt atk gems are equipped, however in reality the damage will be much higher. This is possibly because the status screen doesn't count blunt damage but the total physical damage. Gems that increase all ATK such as Nourishing Blood Gemstones give a much higher damage increase because of this weapon's split damage. To find where to get these gems visit here. The Tonitrus is a simple mace-like weapon that is wielded with only one hand at all times. This trick weapon is useful for builds centering around strength and arcane. Alternatively, it can be used on "pure arcane builds." Since it doesn't have a true transformed mode, the moveset for this trick weapon is more limited compared to many others in existence. It also doesn't have a very fast attack speed when swung. Keep in mind these weaknesses are compensated by the buffed mode when "transformed." When "transformed," it can unleash incredibly potent amounts of damage. The self-buff with L1 adds a fixed amount of bolt damage alongside input from different scalings. The buff works in this formula: +40 Bolt Attack; 1.4x Arcane scaling; 1.7x Bolt Attack. It lasts approximately seven seconds before dissipating. "Transforming" it doesn't consume durability like a normal trick weapon, despite its unique nature. This weapon is tied for lowest durability in the game. It breaks quicker while self-buffed, meaning greater care must be taken to not destroy the weapon quickly while away from the workshop. It roughly loses one durability point every 4-5 hits, which is quicker when compared to the non-buffed form. The other trick weapon that is tied for lowest durability (and breaks quicker when buffed, similar to the Tonitrus) is the Boom Hammer, which is obtainable when you own the DLC. It's considerably useful against opponents that are weak against bolt and blunt damage. 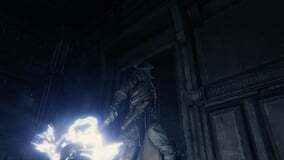 Kin-type enemies are noticeably vulnerable to bolt damage. Dark Beasts are considerably resistant against bolt damage. In PVP, smart opponents will carefully watch the Tonitrus and attack during moments when the Tonitrus isn't buffed. By putting increased pressure and aggresion on you, it becomes more difficult to safely "transform" the trick weapon, therefore weakening your damage potential. They're also more likely to strike when you are in the process of buffing it as well, since you are unable to perform other actions quickly and therefore are vulernable to attacks. Don't forget the somewhat slow attack speed of this weapon; opponents will have an easier time parrying your attacks should you swing the weapon carelessly. Ultimately, paying close attention to how long your Tonitrus will remain buffed is the key to defeating an opponent with this trick weapon. You are essentially sacrificing versatility for simplicity and very high damage potential. Remember that you can still use a firearm and/or hunter tool to fight back as well. Tonitrus is a Latin word meaning "thunder." 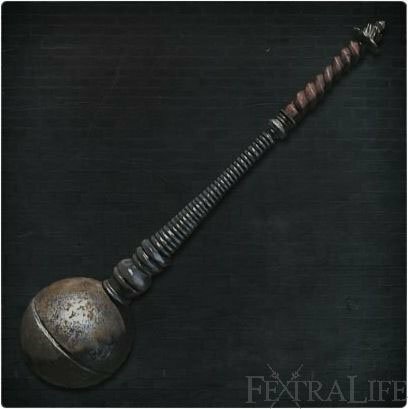 The in-game description classifies this trick weapon as a morning star flail, but it's actually modeled in the form of a mace. The description of Archibald bears many similarities to Nikola Tesla, a famed inventor in real life who specialized in the field of electricity. Nikola Tesla created the Tesla Coil, a device that also bears many similarities to the Tonitrus. The Tonitrus also bears similarities with the aspergillum, a device used by the Roman Catholic Church to sprinkle holy water. According to the description of the Spark Hunter Badge, Archibald was associated with the Healing Church. In this sense, it may have been designed under the themes of "purificiation" and "cleansing" that is associated with many Healing Church trick weapons/tools. 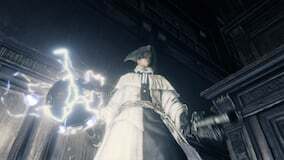 However, due to Archibald's fascination with Dark Beasts, it's more likely he designed the Tonitrus as a measure to replicate the sparks these creatures could unleash. R1 Combo 1.00x 23 A four move combo with attacks 3 and 4 repeating until stamina is depleted. The first attack is from right to left horizontally, followed by a left to right swipe. Both of these drift somewhat downward as well. The third attack is also right to left, but on a diagonal from over the right shoulder to the ground near the left foot. The following attack is a mirror image of this (left to right). Quickstep R1 0.92x 30 There is only one animation for all quickstep attacks with this weapon. As the hunter hops forward, the weapon is thrust forward. Backstep R1 0.98x 30 As the hunter hops forward, the Tonitrus is raised to the left side of the body and swiped horizontally to the right. Rolling R1 0.87x 30 The weapon is thrust forward, just like the quickstep attacks. Dash R1 1.08x 20 (+run) The weapon is lifted to the right side of the body about shoulder height and brought across to the left horizontally. R2 Attack 1.23x 37 The hunter brings the mace behind at about hip height, before lifting over the head and right shoulder and diagonally bringing the weapon down near the left foot.striking the ground. Charged 1.92x 55 The weapon is brought further back and up compared to the R2, before swiping horizontally from right to left. Backstep R2 1.23x 40 The weapon is lifted overhead. As the hunter steps forward, the weapon is brought straight down into the ground. Dash R2 1.18x 30 (+run) The attack uses the same animation as the backstep R2. Leap 1.53x 50 The weapon is lifted over the right shoulder as the character leaps forward, and swung in a downward diagonal from right to left, striking the ground as the hunter lands. Transform Attack 1.10x 40 (+x) The weapon has only one transformation attack animation. Tonitrus is lifted about face level, parallel to the ground pointing left and charged. The weapon is brought back to the right side and thrust forward. Probably the most denigrated weapon in the game. The durability is low, and it&apos;s kinda boring compared to the other weapons. But it&apos;s decent, IMO. I like simplicity. Ill bet Archibald created this weapon by looking at a bowling ball thinking "lol imagine if that were on a stick... That also electrocuted people"
Can confirm the full health damage display glitch has yet to be patched. Thunderstruck! Seriously once I get this weapon (earlier then I should have, thank you snatchers) I rarely put it down. I got this weapon early by accident, got killed by a weirdo enemy in the grand cathedral... Im lv 27! Has anyone paired this with a fire gem? I have and have noticed it does nice against other bosses as well. Anyone els? FRC Loran dskffdu5 - L1 Fading Lake, L2 Stunning Deep Sea, L3 Lost Beast Claw, L4 Uncanny Burial Blade and Lost Tonitrus. Ritual materials: 20 Ritual Blood 5, 12 Tomb Mould 5, 24 Blooming Flowers, 10 Bastards of Loran and 4 Red Jelly. Bosses: Beast-possessed Soul, Undead Giant (chains), Loran Darkbeast and Aamygdala. Is like an ancient thor weapon. Only thing I hate about this weapon is it’s low durability. I often have to set it aside for boss runs or emergency clearance. Weapon is a godsend in dealing with Rom the spider and her spiderlings. The Church probably wasn&apos;t fond of Archibald&apos;s research since his weapons were more useful for killing the Kin, which is probably the opposite of what they wanted. Not to mention they forbade a lot of research into beasthood (beast blood pellets, beast runes, etc.). tbh I feel like it&apos;s way better just to equip a choice weapon with all Bolt blood gems and save it for any time you encounter enemies weak to Bolt, i.e. most kin enemies, at least after the first playthrough. That way you don&apos;t have to worry about durability as much, and you won&apos;t have to bother buffing the weapon, and you could give yourself a way better moveset. My choice weapon for this was Ludwig&apos;s Holy Blade, and now I have over 500 Bolt ATK attached to it, and almost every kin enemy goes down in one or two hits. Ebrietas dies in just about 10 hits to her face with the transformed blade. I cant get what "Arcane scaling 1.4" means. This thing absolutely tore through every single enemy in the game on my second playthrough. Absolute beast while transformed, easiest wetnurse fight of my life. I&apos;d suggest nourishing or bolt gems for this thing, but avoiding odd bolt gems. It appears that bonuses provided by +% gems are multiplied by the buff, whereas the flat bonuses provided by odd gems are added after all other damage, and are not multiplied by the buff. Also, avoid cursed gems with -durability drawbacks, which will ruin the Tonitrus after only a few buffed swings. The wiki mentions this bug twice, but it&apos;s a little unclear - when you are buffed AND at full health, the damage will be listed as much higher. This does not actually change the damage. The article notes at one point that the correct damage is the non-full-health value, but later goes on to say that the correct value is the full-health display. Does anyone know which one it is? So i was messing around with the tonitrus today, and it seems to me that hitting an enemy while using the L1 buff increases the rate of wear on the weapon. Can someone else test this? I hit an enemy twice, and durability was still 100. i then hit two enemies with 1 buffed strike and it Dropped to 96. Thoughts? An actual downside in my eyes is that it does not transform into a different weapon, unlike all other weapons, meaning limited move-set and less versatility. The damage is amazing though.